The Great Work in America, The Indo-American Magazine. Chicago, IL. Publisher: Indo-American Book Co..
1/1, September 1909-1916. 48pp. This was the first organ of the Master T.K.’s Great Work. It is a well-attested example of a successful publishing venture launched by one of the small occult organizations that thrived before World War One, one that still continues today, after a fashion. The Great Work was founded by John E. Richardson (1853-1935) and Florence Chance Huntley (1856-1912). The group's underlying narrative claimed that Richardson, while practicing law in Stockton, California, in 1883, was approached by a mysterious man who told him he had come "from far-off India—the Home of Ancient Mystery" to see him. He studied with this master of the Great Work for 13 months, nine hours a day, and "my final and crowning achievement, under his instruction, was to withdraw at will, from the physical body and travel with him out into the spiritual realms." In this state he was made the 33rd Great Master of the Work, and was shown Florence Huntley, whom he met physically a few years later. The first attempt, which seems never to have come to fruition, was the Illuminati or Order of Light. S.C. Gould describes it in his "Resume of Arcane Societies" (Notes and Queries 1901): "In the year 1883 there came to this country a Master of the Inner Temple of the Brotherhood of India. He came personally to instruct an American pupil previously selected by the Order; and that student now a member of the Order, was the instructor for nearly twelve years of Florence Huntley. She has written a book, "Harmonics of Evolution," a work that is approved by the Brotherhood of India. It Is based on Natural Science and to be taught by the modern Masters of the Law." Then the students who gathered around Huntley and Richardson began to call themselves The Sublime and Ill-Illuminated Order of Tacks, a name based on the ritual names (all embodying the word "tack") given the faithful for the order’s inner rituals. Richardson became "T.K" (TacK) and Huntley "R.A." (Recording Angel). In time the name of the organization became simply the Great Work to the outside world. In 1903, T.K. began the Indo-American Book Company which published the order’s own books and also several by Jirah Dewey Buck (1838-1916), one of the prominent Theosophists of the last quarter of the nineteenth century, who turned to the Great Work when he failed to find satisfaction in other occult groups. In 1909, T.K. launched the quarterly The Indo-American Magazine in Chicago, changing the title after the first issue to Life and Action. From the account of Sylvester A. West, a disgruntled disciple of T.K.’s who later published a most complete and devastating account of the Master’s businesses, by 1914, 40,000 copies of the journal were being printed bimonthly, with 25,000 going to paying subscribers. 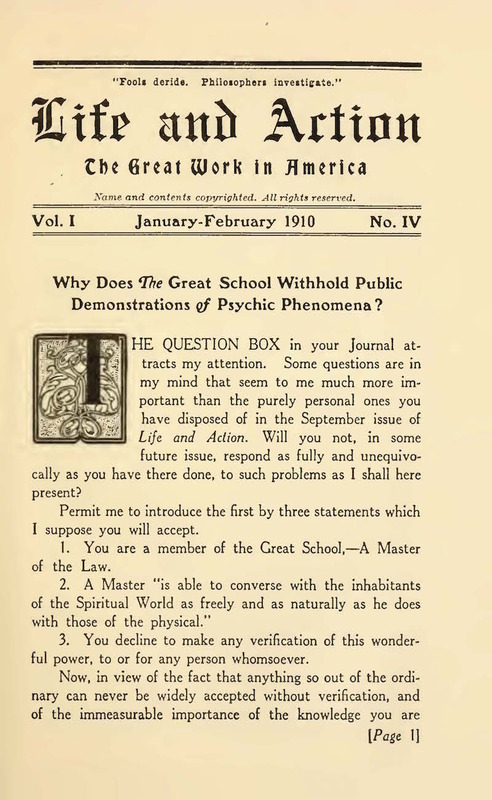 In all, West gives good reason to believe that Richardson and Huntley, in the period from 1903 to 1918, sold 90,000 copies of their books, and received hundreds of thousands of dollars in profits from the publishing company, the lessons that taught the Technical Work (that permitted astral travel), and gifts from the faithful. In 1916 all of this began to come apart when Richardson, who was found by the trustees of the Great Work to be addicted to heroin and possibly in violation of the Mann Act, was bundled off to a Wisconsin sanitarium provided by, and run by, students of the Great Work. There, Richardson was both patient and mage, and there he met (and later married) one of the nurses, known within the Great Work as Noneta Richardson. He and Noneta left the midwest immediately after their marriage, and moved to California, where he bought a mansion, allegedly with funds embezzled from the Great Work. The faithful, split between those who believed T.K. had never been a master and those who believed he had lost that status by his misdeeds, attempted to recover the Great Work's funds — and then covered up the whole matter. Sylvester West, who had run the Indo-American Publishing Company for Richardson, published an attack on T.K., but T.K. went on his way, dying in 1935, a wealthy man. In California he restarted his mission and published The Great Work, To You, and The Great School of Natural Science. The Great Work still continues (in California) as The Great School of Natural Science, and publishes a journal called Life in Action, with volume 29 issued for 2002 which implies an intermediate history. LOC; Princeton Theological Seminary; NYPL; University of Virginia, etc.